Good morning, Quick Quotes Readers, Louise here to host the blog today! My sister took my son to Southern California while I stayed home and froze, but she was nice enough to send me some photos. I created this page using the Far and Away collection and PowderPuff Chalk Inks. My favorite part of this page is the the starburst I created using a template, modeling paste, and PowderPuff Chalk Ink in Tropical Punch. First, I tape the template in place using remove-able tape, adding pieces of scrap paper to protect a larger area. Since this process is messy, I work on wax paper, using a plastic spoon and an old hotel room key (or other plastic card) as my tools. The modeling paste is white, I use 2 methods to color it, both using the PowderPuff Chalk ink in Tropical Punch. For the first method, I stamp down with the ink pad onto the wax paper. 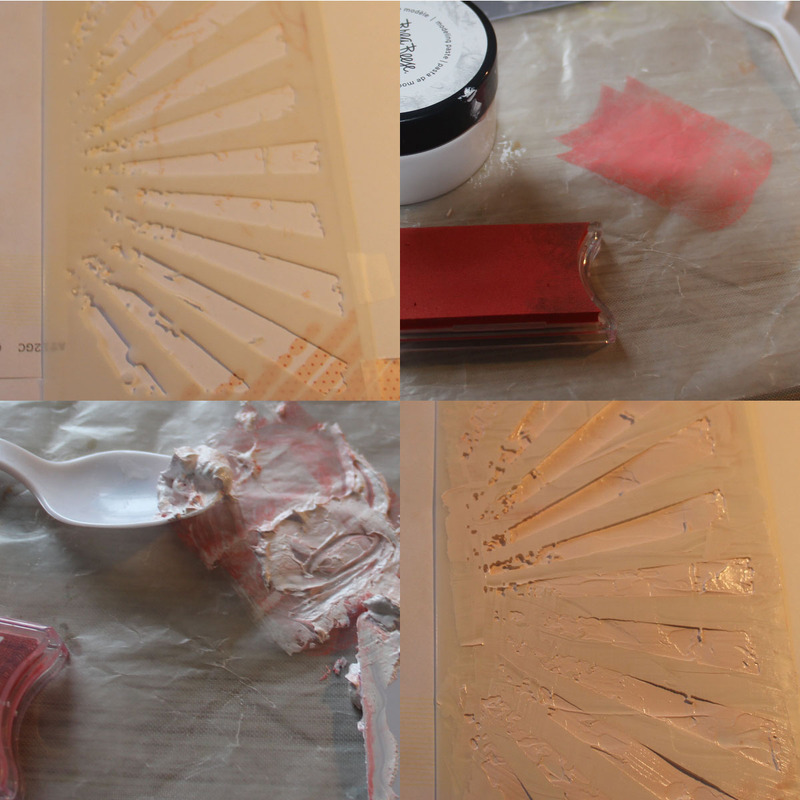 Then I spoon a small amount of modeling paste onto the colored area and mix them together. Since I want a marbled look, I don't mix too thoroughly. When I like the color of the ink and paste mix, I use the card as a palette knife to spread the lightly colored paste over the template. Before anything is dry, I carefully remove the template and wash it and all the tools with water. After the starburst is dry, I use my blending tool to selectively apply the PowderPuff ink to the raised surfaces of the starburst. I add the color a little bit at a time until I have the effect I want. In this close-up of the starburst, you can see the marbled effect I achieved using the PowderPuff ink to color the modeling paste. I really like how well it matches with the patterned papers. The flowers on the left of my layout were die-cut from the Navigator 100 paper and shaped with water. The flowers centers are pearls leftover from my February Club Q kit. The flowers on the right were fussy-cut from the Far and Away 101 paper. To finish the page, I added a couple elements from the Far and Away Quotes and Phrases.